Not for quite that long (I only discovered Renoise about a year or so ago). Keep in mind, though, that music is a hobby for me, something I do in the not particularly copious amount of free time I have, so anything that slows me down and disorients me as much as this problem does results in me not getting anything accomplished in the time I have to work on music (and not inclined to put money toward software that makes the time I spend on music less productive and less enjoyable). It’s obviously different for people who make music for a living or who have more free time to work with a given piece of software. PLEASE PLEASE PLEASE add this feature, this is literally my #1 complaint about Renoise…the centered cursor is so damn annoying. I also almost didn’t purchase a license for the exact same reason as OP. This isn’t something I ever really thought about, but now that it’s been drawn to my attention I’d have to agree. Seems like a simple option like “Enable/Disable cursor focus” should be doable? Sometimes the cursor focus is kind of useful, other times it can be a bit annoying because I can’t see the full pattern. Sometimes when I want to utilize a specific note, but can’t remember what it is I have to keep scrolling back up to remember what the note is. 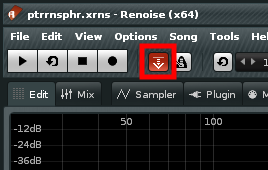 Doesn’t break Renoise for me, but could be better implemented. Would increase workflow for sure. +1 from me (again!). I must admit that after a year or more of using Renoise the scrolling nausea has subsided to some extent, but still an option I’d very much like to see! Could a dev please respond to this? I’ve seen this requested many times, but don’t remember seeing any reply from the renoise team. dblue responded in the old thread I linked to in my original post, but it was only to acknowledge that he understood the problem, not that it was or was not something that was likely to ever be implemented, or whether it would be relatively simple to code, or an absolute nightmare. I’d like to hear from a dev at least about how difficult this would be to do–it seems like a really small thing that ought to be easy, but the programming required might be disproportionately complicated. I’d like to hear from a dev at least about how difficult this would be to do–it seems like a really small thing that ought to be easy. I suspect if it was easy, they would have done it and added a checkbox in the preferences to allow toggling between new and old behavior. Pattern follow mode off then also means no pattern scrolling and pattern follow mode on, means centered edit position. In that regard, they don’t need to change much GUI wise and perhaps with Pattern follow mode off, this is also a much easier option to implement. I don’t mind to see this added, but don’t wait for it. Better start getting accustomed to Renoises workflow, or else you’re always going to find (psychological) roadblocks . Yes, I would love to see this option because of this too. Although I don’t mind the scrolling pattern when recording, there are many times when the possibility of fixed view over the whole pattern would be great. Definitely +1! I don’t mind to see this added, but don’t wait for it. Better start getting accustomed to Renoises workflow, or else you’re always going to find (psychological) roadblocks /> . I actually don’t have any problems with any other part of Renoise’s workflow–if this issue were addressed, I’d be off to the races. Just wanted to put down my +1 for this feature. Like the OP, this is the one thing that seriously impedes my overall workflow. I just can’t wrap my head around it as it is now… I’m relatively new to renoise, but have used Impulse Tracker for several years back in the days, and nothing I’ve tried since, apart from renoise, comes close to the speed I worked with then, except for this one thing. If at all possible, please, please, please add this feature. Ah, just discovered this amazing software for myself, but this is what made a confusion to me also. Please, +1 request from me also. In lieu of having this native I’ve wondered if a tool could manage it. As a “maybe good enough” approach I was imagining a floating window with a read-only view of the current pattern state. It would update as the pattern was edited. Then you could edit on the centered line but still see the full pattern. I prefer to see this feature as part of the main program in regards to the editing/tracking behaviour (e.g. as in Jeskola Buzz). At least it would be nice to have the option. When you are in the “record mode” and click a cell with a mouse to select it - it just jumps away to somewhere in the middle. It is very confusing. Also, as it was mentioned before, you just can’t see the whole pattern while editing on the “edges” of it. Yeah, came here wondering if there was a way to fix this. It drives me absolutely bonkers and sorta discourages any mouse usage in the edit window. Another person used Excel as an example, but I’d argue this would be a terrible design for ANY software outside of a first-person shooter. I guess if you get by via shortcuts it’s not much of a bother, but my memory seems maxed out on shortcut keys given the variety of media editing software with which I’m already working. +1 on this feature. If I need to scroll, I’ll use my wheel.